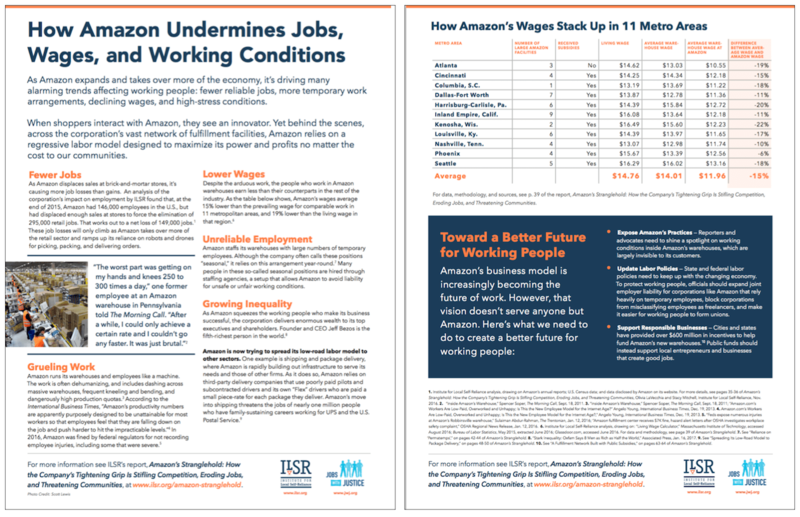 The Institute for Local Self-Reliance (ILSR) recently released an in-depth report on Amazon, and this week, ILSR and Jobs With Justice partnered to produce a fact sheet that looks at how Amazon is undermining working people. 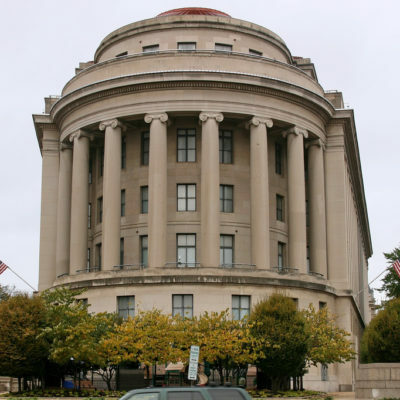 This post highlights ILSR’s findings on how this fast-growing corporation is increasingly at the center of many alarming economic trends. 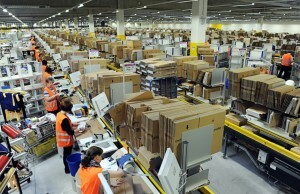 People working at an Amazon warehouse. Photo by Scott Lewis. When an Amazon box lands on the doorstep in as little as an hour after it’s ordered, it can seem like magic. Behind that magic, though, lies a vast network of warehouses—often nondescript, windowless buildings on the outskirts of cities—where tens of thousands of people unload and sort goods, pick and pack orders, and prepare to deliver those boxes. These women and men describe their jobs as exceptionally grueling. They report racing across warehouses that can sprawl the distance of more than a dozen football fields; frequent bending and squatting; and production quotas that are set impossibly high—by one measure 60 percent above the industry standard. “The worst part was getting on my hands and knees 250 to 300 times a day,” a man working as a picker in a Pennsylvania warehouse told the paper The Morning Call, adding that he was expected to pick 1,200 items in a 10-hour shift, and that frequently involved fishing items out of bins near the floor. “It’s actually impossible to meet the productivity standards and do so safely,” Beth Gutelius, a researcher who has studied Amazon, told us. Despite these demands and risks, Amazon treats its employees as expendable. Roughly 40 percent of the people working in Amazon warehouses are temporary employees who lack job benefits and security. Though Amazon refers to these positions as “seasonal,” we found that it relies on temporary employees year-round and hires many of these workers through staffing agencies. By not hiring people directly, Amazon skirts liability for injuries and mistreatment they suffer on the job. Amazon’s regular direct hires are scarcely better off. Average wages for warehouse work are already low, and Amazon pays its employees even less. We looked at Amazon’s wages in 11 metro areas and found that it pays an average of 15 percent less than the prevailing wage for comparable work. 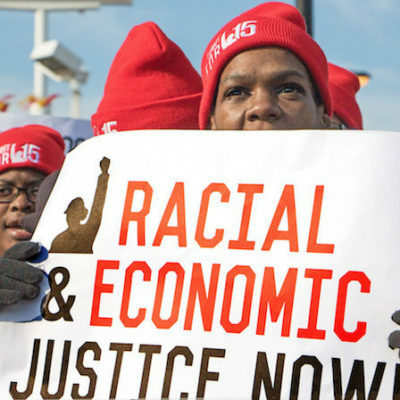 In Atlanta, for instance, where Amazon has three large facilities, Amazon’s wages are 19 percent lower than the prevailing warehouse wage, and 29 percent below the living wage for the region. Click on the image to download the full fact sheet. 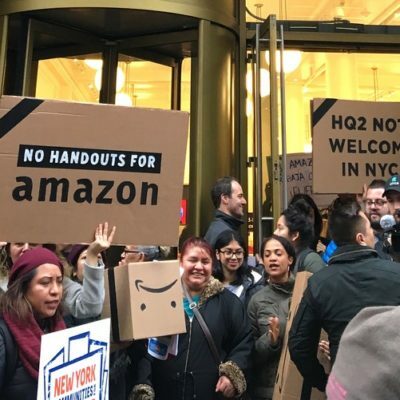 Addressing working conditions at Amazon is a task taking on new urgency because the corporation is rapidly coming to dominate the retail industry. 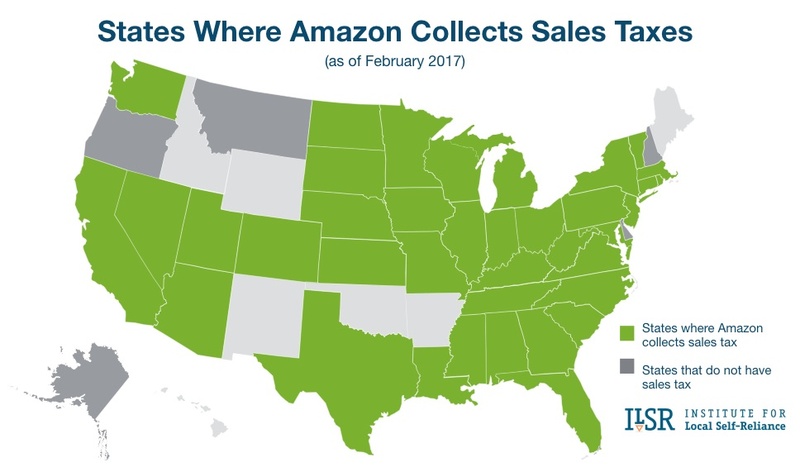 Online shopping is booming, and our analysis estimates that Amazon is now capturing nearly one in every two dollars that Americans spend online. 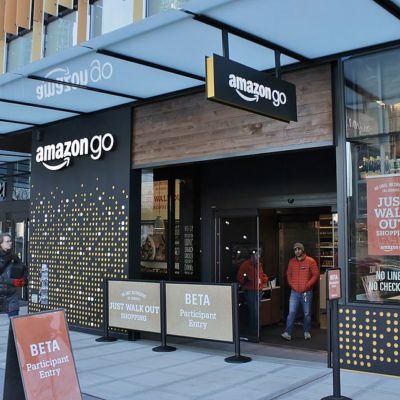 Already it sells more books, toys, and by later this year, apparel and consumer electronics than any retailer, online or off, and it is investing heavily in its grocery business. As our report documents, Amazon is at the center of many troubling trends affecting working people, and it’s harming our communities in other ways, too. Through predatory practices, Amazon is forcing locally owned independent retailers out of business. 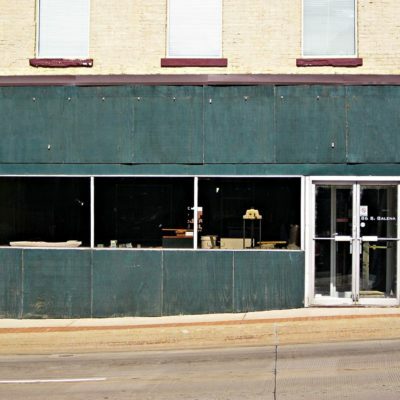 As both these stores and major chains close their doors, communities are losing a critical source of property and sales tax revenue, which they rely on to pay for basic services. 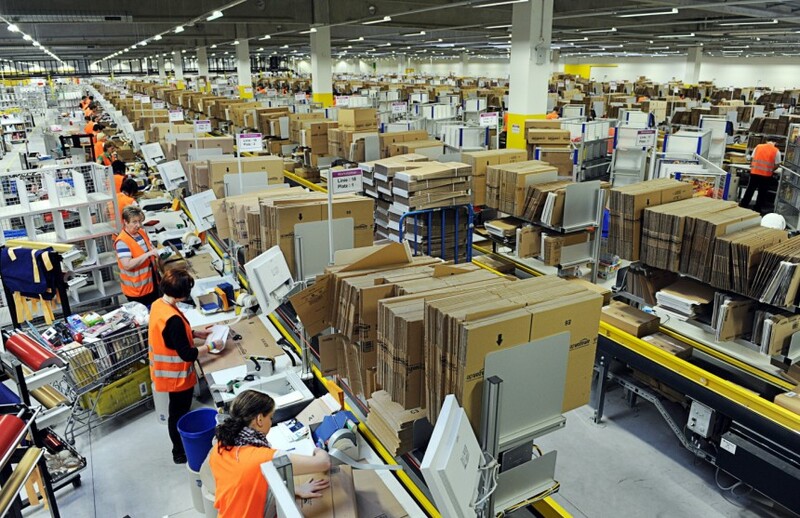 milnce mid-2015, Amazon has more than doubled its warehouse and delivery facilities. When these new facilities come online, Amazon gets featured in headlines as a job creator, and praised by public officials as an innovator and leading light of the economy. Indeed, local and state governments have provided over $600 million in incentives to subsidize Amazon’s expansion. The dirty secret behind Amazon’s rise, however, is that as it displaces sales at other businesses, it in fact destroys more jobs than it creates. The company employed 146,000 U.S. workers at the end of 2015, we find, but at the cost of about 295,000 jobs lost at brick-and-mortar retail stores and other businesses. Addressing working conditions at Amazon is also becoming more urgent because the corporation’s ambitions extend far beyond retail. 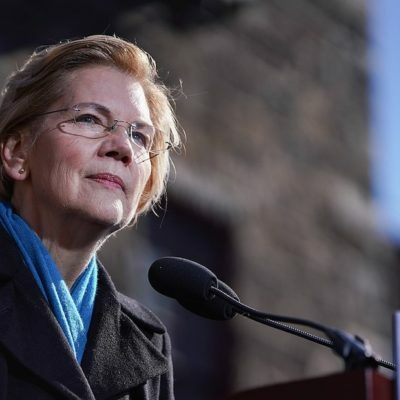 One example is its moves into package delivery, a sector of the economy that has traditionally provided good jobs, like those of nearly one million people who have earned family-sustaining salaries at UPS and the U.S. Postal Service. Amazon is now aggressively building out its own delivery infrastructure to serve its needs and those of other firms. 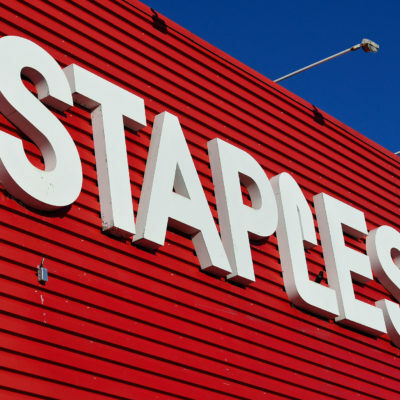 It recently purchased 4,000 trailers to move its goods, leased a fleet of air cargo planes, and opened more than 20 sortation centers and dozens of delivery stations. As it brings package delivery in-house, Amazon is using an Uber-like app to manage freelance drivers and also turning to low-cost regional courier companies. These companies distinguish themselves by being willing to meet tight delivery windows on the cheap. They’re able to do this, in large part, by classifying their delivery drivers as “independent contractors” instead of employees, and requiring these drivers to pay out-of-pocket for fuel, insurance, and other expenses. As a result, drivers at times earn less than minimum wage, according to drivers in California and Arizona who recently filed suit against Amazon. The company’s air cargo is likewise handled by a third-party contractor and late last year its pilots went on strike to protest an excessive workload. Like in Amazon’s warehouses, here too, Amazon’s approach to the people who work for it isn’t innovative. Meanwhile, even as Amazon squeezes working people, it’s delivering enormous wealth to a handful of top executives and shareholders. Amazon founder and CEO Jeff Bezos is now the planet’s fifth-wealthiest person, with an estimated net worth of $65 billion. We urgently need to support workers at Amazon who are campaigning and organizing for better conditions, and we also need public policy to keep up with the changing economy. To protect working people, public officials should expand joint employer liability for corporations like Amazon that rely heavily on temporary employees, block corporations from misclassifying employees as freelancers, enforce existing wage-and-hour laws, and make it easier for working people to form unions.